The advance of web services technologies promises to have far-reaching effects on the Internet and enterprise networks allowing for greater accessibility of data. The security challenges presented by the web services approach are formidable. 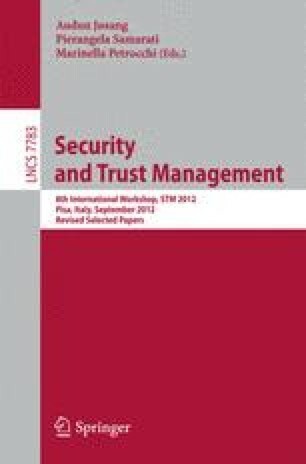 In particular, access control solutions should be revised to address new challenges, such as the need of using certificates for the identification of users and their attributes, human intervention in the creation or selection of the certificates, and (chains of) certificates for trust management. With all these features, it is not surprising that analyzing policies to guarantee that a sensitive resource can be accessed only by authorized users becomes very difficult. In this paper, we present an automated technique to analyze scenario-based specifications of access control policies in open and distributed systems. We illustrate our ideas on a case study arising in the e-government area. The work presented in this paper was supported by the FP7-ICT-2009-5 Project no. 257876, “SPaCIoS: Secure Provision and Consumption in the Internet of Services”, and by the “Automated Security Analysis of Identity and Access Management Systems (SIAM)” project funded by Provincia Autonoma di Trento in the context of the “Team 2009 - Incoming” COFUND action of the European Commission (FP7).